The cgroups subsystem provides resource management and accounting. It lets you define easily, for example, the maximum memory that a process may use. This is done by using cgroups VFS operations. The cgroups project was started by two Google developers, Paul Menage and Rohit Seth, back in 2006, and it initially was called “process containers”. Neither namespaces nor cgroups intervene in critical paths of the kernel, and thus they do not incur a high performance penalty, except for the memory cgroup, which can incur significant overhead under some workloads. Google containers: in 2013, Google released the open-source version of its container stack, lmctfy (which stands for Let Me Contain That For You). Right now, it’s still in the beta stage. The lmctfy project is based on using cgroups. Currently, Google containers do not use the kernel namespaces feature, which is used by other Linux-based container projects, but using this feature is on the Google container project roadmap. The first lxc-console that you run for a given container will connect you to tty1. If tty1 already is in use (because that’s the second lxc-console that you run for that container), you will be connected to tty2 and so on. Keep in mind that the maximum number of ttys is configured by the lxc.tty entry in the container configuration file. There are five types of network interfaces that you can set with the lxc.network.type parameter: empty, veth, vlan,macvlan and phys. Using veth is very common in order to be able to connect a container to the outside world. By using phys, you can move network interfaces from the host network namespace to the container network namespace. There are features that can be used for hardening the security of LXC containers. You can avoid some specified system calls from being called from within a container by setting a secure computing mode, or seccomp, policy with the lxc.seccomp entry in the configuration file. You also can remove capabilities from a container with the lxc.cap.drop entry. For example, setting lxc.cap.drop = sys_module will create a container without the CAP_SYS_MDOULE capability. Trying to run insmod from inside this container will fail. You also can define Apparmor and SELinux profiles for your container. You can find examples in the LXC README and inman 5 lxc.conf. To display the images available on your host, you can use thedocker images command. You can narrow the command for a specific type of images (fedora, for example) with docker images fedora. Docker has git-like capabilities for handling containers. Changes you make in a container are lost if you destroy the container, unless you commit your changes (much like you do in git) withdocker commit <containerId> <containerName/containerTag>. These images can be uploaded to a public registry, and they are available for downloading by anyone who wants to download them. Alternatively, you can set a private Docker repository. Docker is able to create a snapshot using the kernel device mapper feature. In earlier versions, before Docker version 0.7, it was done using AUFS (union filesystem). Docker 0.7 adds “storage plugins”, so people can switch between device mapper and AUFS (if their kernel supports it), so that Docker can run on RHEL releases that do not support AUFS. The Checkpoint/Restore feature enables saving a process state in several image files and restoring this process from the point at which it was frozen, on the same host or on a different host at a later time. This process also can be an LXC container. The image files are created using Google’s protocol buffer (PB) format. The Checkpoint/Restore feature enables performing maintenance tasks, such as upgrading a kernel or hardware maintenance on that host after checkpointing its applications to persistent storage. Later on, the applications are restored on that host. Let’s look at a simple example of using the criu tool. First, you should check whether your kernel supports Checkpoint/Restore, by running criu check --ms. Look for a response that says "Looks good." In this article, I’ve described what Linux-based containers are, and I briefly explained the underlying cgroups and namespaces kernel features. I have discussed some Linux-based container projects, focusing on the promising and popular LXC project. I also looked at the LXC-based Docker engine, which provides an easy and convenient way to create and deploy LXC containers. Several hands-on examples showed how simple it is to configure, manage and deploy LXC containers with the userspace LXC tools and the Docker tools. Docker – a Linux Container. Docker containers can encapsulate any payload, and will run consistently on and between virtually any server. The same container that a developer builds and tests on a laptop will run at scale, in production, on VMs, bare-metal servers, OpenStack clusters, public instances, or combinations of the above. What is the Relationship between Docker and dotCloud? What Are Some Cool Use Cases For Docker? Fifteen years ago, virtually all applications were written using well defined stacks of services and deployed on a single monolithic, proprietary server. Today, developers build and assemble applications using a multiplicity of the best available services, and must be prepared for those applications to be deployed across a multiplicity of different hardware environments, included public, private, and virtualized servers. Or, viewed as a matrix, we can see that there is a huge number of combinations and permutations of applications/services and hardware environments that need to be considered every time an application is written or rewritten. This creates a difficult situation for both the developers who are writing applications and the folks in operations who are trying to create a scalable, secure, and highly performance operations environment. How to solve this problem? A useful analogy can be drawn from the world of shipping. Before 1960, most cargo was shipped break bulk. Shippers and carriers alike needed to worry about bad interactions between different types of cargo (e.g. if a shipment of anvils fell on a sack of bananas). Similarly, transitions between different modes of transport were painful. Up to half the time to ship something could be taken up as ships were unloaded and reloaded in ports, and in waiting for the same shipment to get reloaded onto trains, trucks, etc. Along the way, losses due to damage and theft were large. And, there was an n X n matrix between a multiplicity of different goods and a multiplicity of different transport mechanisms. Fortunately, an answer was found in the form of a standard shipping container. Any type of goods, from pistachios to Porsches, can be packaged inside a standard shipping container. The container can then be sealed, and not re-opened until it reaches its final destination. In between, the containers can be loaded and unloaded, stacked, transported, and efficiently moved over long distances. The transfer from ship to gantry crane to train to truck can be automated, without requiring a modification of the container. Many authors credit the shipping container with revolutionizing both transportation and world trade in general. Today, 18 million standard containers carry 90% of world trade. To some extent, Docker can be thought of as an intermodal shipping container system for code. Docker enables any application and its dependencies to be packaged up as a lightweight, portable, self-sufficient container. Containers have standard operations, thus enabling automation. And, they are designed to run on virtually any Linux server. The same container that that a developer builds and tests on a laptop will run at scale, in production, on VMs, bare-metal servers, OpenStack clusters, public instances, or combinations of the above. It is useful to compare the main features of Docker to those of shipping containers. (See the analogy above). Separation of duties Shipper worries about inside of box, carrier worries about outside of box Developer worries about code, Ops worries about infrastructure. Filesystem isolation: each process container runs in a completely separate root filesystem. Copy-on-write: root filesystems are created using copy-on-write, which makes deployment extremely fast, memory-cheap and disk-cheap. Logging: the standard streams (stdout/stderr/stdin) of each process container is collected and logged for real-time or batch retrieval. Change management: changes to a container’s filesystem can be committed into a new image and re-used to create more containers. No templating or manual configuration required. Docker makes it easy to build, modify, publish, search, and run containers. The diagram below should give you a good sense of the Docker basics. With Docker, a container comprises both an application and all of its dependencies. Containers can either be created manually or, if a source code repository contains a DockerFile, automatically. Subsequent modifications to a baseline Docker image can be committed to a new container using the Docker Commit Function and then Pushed to a Central Registry. Containers can be found in a Docker Registry (either public or private), using Docker Search. Containers can be pulled from the registry using Docker Pull and can be run, started, stopped, etc. using Docker Run commands. Notably, the target of a run command can be your own servers, public instances, or a combination. Docker runs three ways: * as a daemon to manage LXC containers on your Linux host (sudo docker -d) * as a CLI which talks to the daemon’s REST API (docker run …) * as a client of Repositories that let you share what you’ve built (docker pull, docker commit). A container comprises an application and its dependencies. Containers serve to isolate processes which run in isolation in userspace on the host’s operating system. This differs significantly from traditional VMs. Traditional, hardware virtualization (e.g. VMWare, KVM, Xen, EC2) aims to create an entire virtual machine. Each virtualized application contains not only the application (which may only be 10’s of MB) along with the binaries and libraries needed to run that application, and an entire Guest operating System (which may measure in 10s of GB). Since all of the containers share the same operating system (and, where appropriate, binaries and libraries), they are significantly smaller than VMs, making it possible to store 100s of VMs on a physical host (versus a strictly limited number of VMs). In addition, since they utilize the host operating system, restarting a VM does not mean restarting or rebooting the operating system. Thus, containers are much more portable and much more efficient for many use cases. With Docker Containers, the efficiencies are even greater. With a traditional VM, each application, each copy of an application, and each slight modification of an application requires creating an entirely new VM. As shown above, a new application on a host need only have the application and its binaries/libraries. There is no need for a new guest operating system. If you want to run several copies of the same application on a host, you do not even need to copy the shared binaries. Finally, if you make a modification of the application, you need only copy the differences. This not only makes it efficient to store and run containers, it also makes it extremely easy to update applications. As shown in the next figure, updating a container only requires applying the differences. Docker is an open-source implementation of the deployment engine which powers dotCloud, a popular Platform-as-a-Service. It benefits directly from the experience accumulated over several years of large-scale operation and support of hundreds of thousands of applications and databases. dotCloud is the chief sponsor of the Docker project, and dotCloud CTO is the original architect and current, overall maintainer. While several dotCloud employees work on Docker full-time, Docker is a true community project, with hundreds of non-Docker contributors and a complete open design philosophy. All pulls, pushes, forks, bugs, issues, and roadmaps are available for viewing, editing, and commenting on GitHub. Docker is a powerful tool for many different use cases. Here are some great early use cases for Docker, as described by members of our community. Click here to get started, including full instructions, code, and documentation. We’ve also prepared an interactive tutorial to help you get started. The Docker project is hosted on GitHub. Click here to visit the repository. With the introduction of the solid-state Flash drive, performance came to the forefront for data storage technologies. Prior to that, software developers and server administrators needed to devise methods for which they could increase I/O throughput to storage, most of which resulted in low capacity caching to random access memory (RAM) or a RAM drive. Although not as fast as RAM, the Flash drive was almost a dream come true, but it had its limitations—one of which was its low capacities packaged in the NAND-based chips. The traditional spinning disk drive provided users’ desired capacities but lacked in speedy accessibility. Even with the 6Gb SATA protocol, sequential data access at best performed at approximately 150MB per second (or MB/s) for both read and write operations, while random access varied between 2–5MB/s as the seeking across multiple sectors laid out in multiple tracks across multiple spinning platters proved to be an extremely disruptive bottleneck. The solid-state drive (SSD) with no movable components significantly decreased these access latencies, thus rendering this bottleneck almost nonexistent. The dm-cache documentation hosted on the project site provides details on each parameter field, so I don’t cover them here. You may notice that in both examples, I named the mapping to both drives “cache”. So, when I need to access the drive mapping, I must refer to it as “cache”. Notice that the write performance is not very great, and that’s because it is not meant to be. Write-through mode promises only faster read performance of cached data and consistent write performance to the original drive. The read performance, however, shows significant improvement when accessing cached data. bcache is relatively new to the hard drive caching scene. It offers all the same features and functionalities as the previous solutions with the exception of its capability to map one or more SSDs as the cache for one or more HDDs instead of one volume to one volume. The project’s maintainer does, however, tout its superiority over the other solutions when it comes to data access performance from the cache. From what I can tell, bcache is unlike the previous solutions where it does not rely on the device-mapper framework and instead is a standalone module. At the time of this writing, it is set to be integrated into release 3.10 of the Linux kernel tree. Unfortunately, I haven’t had the opportunity or the appropriate setup to test bcache. As a result, I haven’t been able to dive any deeper into this solution and benchmark its performance. EnhanceIO is an SSD caching solution produced by STEC, Inc., and hosted on GitHub. It was greatly inspired by the work done by Facebook for FlashCache, and although it’s open-source, a commercial version is offered by the company for those seeking additional support. STEC did not simply modify a few lines of code of FlashCache and republish it. Instead, STEC rewrote the write-back caching logic while also improving other areas, such as memory footprint, failure handling and more. As with bcache, I haven’t had the opportunity to install and test EnhanceIO. These solutions are intended to provide users with near SSD speeds and HDD capacities at a significantly reduced cost. From the data center to your home office, these solutions can be deployed almost anywhere. They also can be tuned to operate more appropriately in their intended environments. Some of them even offer a variety of caching algorithm options, such as Least Recently Used (LRU), Most Recently Used (MRU), hybrids of the two or just a simple first-in first-out (FIFO) caching scheme. The first three options can be expensive regarding performance, as they require the tracking of cached data sets for what has been accessed and how recently in order to determine whether to discard it. FIFO, however, functions as a circular buffer in which the oldest cached data set will be discarded first. With the exception of RapidCache, the SSD-focused modules also preserve metadata of the cache to ensure that any disruptions, including power cycles/outages, don’t compromise the integrity of the data. I remember the first time a friend of mine introduced me to Linux and showed me how I didn’t need to type commands and path names fully—I could just start typing and use the Tab key to complete the rest. That was so cool. I think everybody loves Tab completion because it’s something you use pretty much every minute you spend in the shell. Over time, I discovered many more shortcuts and time-saving tricks, many of which I have come to use almost as frequently as Tab completion. Screen has been covered in Linux Journal before (see Resources), but to put it simply, screen lets you have multiple “windows” within a single terminal application. The best part is that you can detach and reattach to a running screen session at any time, so you can continue your previous work exactly where you left off. This is most useful when working on a remote server. screen -R projectx: reattach to the screen session named “projectx” or create it fresh now. Note: in the above list, “Ctrl-a c” means pressing the Ctrl and a keys at the same time, followed by c. Ctrl-a is called the command key, and all screen commands start with this key sequence. Of course, I could do all these things one by one, but it’s a lot more practical to have multiple windows open for each. I could use multiple real terminal windows, but reopening them every time I need to do this kind of work would be tedious and slow. Screen can make this much faster and easier. Before you start screen, it’s good to navigate to the directory where you expect to do most of your work first. This is because new windows within screen will all start in that directory. In my example, I first navigate to my Django project’s directory, so that when I open new screen windows, the relevant files will be right there in front of me. Let’s say I made some changes, and now I want to restart the site. I could exit vim or put it in the background in order to run the command to restart the site, but I anticipate I will need to make further changes right here. It’s easier just to create a new window now, using the screen command Ctrl-a c.
It’s easy to create another window every time you start doing something different from your current activity. This is especially useful when you need to change the directory between commands. For example, if you have script files in /some/long/path/scripts and log files in /other/long/path/logs, then instead of jumping between directories, just keep a separate window for each. The cost of creating a new window is so small, you can do it without thinking. Don’t interrupt your current activity; fire up another window with Ctrl-a c and rock on. The windows you create in screen are numbered starting from zero. You can switch to a window by its number—for example, jump to the first window with Ctrl-a 0, the second window with Ctrl-a 1 and so on. It’s also very convenient to switch to the next and previous windows with Ctrl-a n and Ctrl-a p, respectively. If you’re starting to lose track of which window you are in, check the list of windows with Ctrl-a w or Ctrl-a “. The former shows the list of windows in the status line (at the bottom) of the screen, showing the current window marked with a *. The latter shows the list of windows in a more user-friendly format as a menu. The best time-saving feature of screen is reattaching to existing sessions. You can detach cleanly from the current screen session with Ctrl-a d. But you don’t really need to. You could just as well simply close the terminal window. I also should mention one of screen’s competitor: tmux. I chose screen in this article because in my experience, it is more available in systems I cannot control. You can do everything I covered above with tmux as well. Use whichever is available in the remote system in which you find yourself. Finally, you can get the most out of screen when working on a remote system—for example, over an SSH session. When working locally, it’s probably more practical to use a terminal application with tabs. That’s not exactly the same thing, but probably close enough. If you want to repeat a command you executed recently, it may be easy enough just to press the up-arrow key a few times until you find it. If the command was more than only a few steps ago though, this becomes unwieldy. Very often, it’s much more practical to use the Ctrl-r shortcut instead to find a specific command by a fragment. Let’s say I want to activate the virtualenv again. That’s a hassle to type again, because I have to type at least a few characters at each path segment, even with Tab completion. Instead, it’s a lot easier to press Ctrl-r and start typing “activate”. For a slightly more complex example, let’s say I want to run a git push command again, but I don’t remember exactly which one. So I press Ctrl-r and start typing “push”. This will match the most recent command, but I actually want the one before that, and I don’t remember a better fragment to type. The solution is to press Ctrl-r again, in the middle of my current search, as that jumps to the next matching command. This is really extremely useful, saving not only the time of typing, but also often the time of thinking too. Imagine one of those long one-liners where you processed a text file through a long sequence of pipes with sed, awk, Perl and whatnot; or an rsync command with many flags, filters and exclusions; or complex loops using “for” and “while”. You can bring those back to your command line quickly using Ctrl-r and some fragment you remember from them. Press Ctrl-w to cut the path part: “/path/to/repo.git”. Don’t clear the command line with the Backspace key. Use Ctrl-c instead. Don’t delete long arguments with the Backspace key. Use Ctrl-w instead. Don’t move to the beginning or the end of the line using the left- and right-arrow keys. Jump with Ctrl-a and Ctrl-e instead. Don’t move over long terms using the arrow keys. Jump over terms with Esc-b and Esc-f instead. Don’t press the up arrow 20 times to find a not-so-recent previous command. Jump to it directly with Ctrl-r instead. Don’t type anything twice on the same line. Copy it once with Ctrl-w, and reuse it many times with Ctrl-y instead. If you want to learn more, see the bash man page and search for “READLINE”, “Commands for Moving” and “Commands for Changing Text”. For example, let’s say you are viewing a server log with initialization information near the beginning of the file and some errors somewhere in the middle. You need to switch between the two parts while trying to figure out what’s going on, but using search repeatedly to find the relevant parts is very inconvenient. A good solution is to place markers at the two locations so you can jump to them directly. Markers work similarly as in the vim editor: you can mark the current position by pressing m followed by a lowercase letter, and you can jump to a marker by pressing ‘ followed by the same letter. In this example, I would mark the initialization part with mi and the part with the error with me, so that I could jump to them easily with ‘i and ‘e. I chose the letters as the initials of what the locations represent, so I can remember them easily. This is essentially an infinite loop, with an appropriate CONDITIONin the middle to exit the loop and, thus, trigger the e-mail command. Inside the loop, I print the date, just so that I can see the loop is alive, and sleep for five minutes (300 seconds) in each cycle to avoid overloading the machine I’m on. find /path/to/jar -newer /path/to/jar.marker: this assumes that before starting the infinite loop, you created a marker file like this: touch -r /path/to/jar /path/to/jar.marker in order to save a copy of the exact same timestamp as the .jar file you want to monitor. The findcommand will exit with success after the jar file has been updated. In short, don’t wait for a long-running task or some external event. Set up an infinite loop, and alert yourself by e-mail when there is something interesting to see. Type man bash, and search for “READLINE”, “Commands for Moving” and “Commands for Changing Text”. Packet queues are a core component of any network stack or device. They allow for asynchronous modules to communicate, increase performance and have the side effect of impacting latency. This article aims to explain where IP packets are queued on the transmit path of the Linux network stack, how interesting new latency-reducing features, such as BQL, operate and how to control buffering for reduced latency. Between the IP stack and the network interface controller (NIC) lies the driver queue. This queue typically is implemented as a first-in, first-out (FIFO) ring buffer (http://en.wikipedia.org/wiki/Circular_buffer)—just think of it as a fixed-sized buffer. The driver queue does not contain the packet data. Instead, it consists of descriptors that point to other data structures called socket kernel buffers (SKBs,http://vger.kernel.org/%7Edavem/skb.html), which hold the packet data and are used throughout the kernel. The input source for the driver queue is the IP stack that queues IP packets. The packets may be generated locally or received on one NIC to be routed out another when the device is functioning as an IP router. Packets added to the driver queue by the IP stack are dequeued by the hardware driver and sent across a data bus to the NIC hardware for transmission. The reason the driver queue exists is to ensure that whenever the system has data to transmit it is available to the NIC for immediate transmission. That is, the driver queue gives the IP stack a location to queue data asynchronously from the operation of the hardware. An alternative design would be for the NIC to ask the IP stack for data whenever the physical medium is ready to transmit. Because responding to this request cannot be instantaneous, this design wastes valuable transmission opportunities resulting in lower throughput. The opposite of this design approach would be for the IP stack to wait after a packet is created until the hardware is ready to transmit. This also is not ideal, because the IP stack cannot move on to other work. Most NICs have a fixed maximum transmission unit (MTU), which is the biggest frame that can be transmitted by the physical media. For Ethernet, the default MTU is 1,500 bytes, but some Ethernet networks support Jumbo Frames (http://en.wikipedia.org/wiki/Jumbo_frame) of up to 9,000 bytes. Inside the IP network stack, the MTU can manifest as a limit on the size of the packets that are sent to the device for transmission. For example, if an application writes 2,000 bytes to a TCP socket, the IP stack needs to create two IP packets to keep the packet size less than or equal to a 1,500 MTU. For large data transfers, the comparably small MTU causes a large number of small packets to be created and transferred through the driver queue. In order to avoid the overhead associated with a large number of packets on the transmit path, the Linux kernel implements several optimizations: TCP segmentation offload (TSO), UDP fragmentation offload (UFO) and generic segmentation offload (GSO). All of these optimizations allow the IP stack to create packets that are larger than the MTU of the outgoing NIC. For IPv4, packets as large as the IPv4 maximum of 65,536 bytes can be created and queued to the driver queue. In the case of TSO and UFO, the NIC hardware takes responsibility for breaking the single large packet into packets small enough to be transmitted on the physical interface. For NICs without hardware support, GSO performs the same operation in software immediately before queueing to the driver queue. Recall from earlier that the driver queue contains a fixed number of descriptors that each point to packets of varying sizes. Since TSO, UFO and GSO allow for much larger packets, these optimizations have the side effect of greatly increasing the number of bytes that can be queued in the driver queue. Figure 3 illustrates this concept in contrast with Figure 2. Figure 3. Large packets can be sent to the NIC when TSO, UFO or GSO are enabled. This can greatly increase the number of bytes in the driver queue. Although the focus of this article is the transmit path, it is worth noting that Linux has receive-side optimizations that operate similarly to TSO, UFO and GSO and share the goal of reducing per-packet overhead. Specifically, generic receive offload (GRO,http://vger.kernel.org/%7Edavem/cgi-bin/blog.cgi/2010/08/30) allows the NIC driver to combine received packets into a single large packet that is then passed to the IP stack. When the device forwards these large packets, GRO allows the original packets to be reconstructed, which is necessary to maintain the end-to-end nature of the IP packet flow. However, there is one side effect: when the large packet is broken up, it results in several packets for the flow being queued at once. This “micro-burst” of packets can negatively impact inter-flow latency. If the NIC driver wakes to pull packets off of the queue for transmission and the queue is empty, the hardware will miss a transmission opportunity, thereby reducing the throughput of the system. This is referred to as starvation. Note that an empty queue when the system does not have anything to transmit is not starvation—this is normal. The complication associated with avoiding starvation is that the IP stack that is filling the queue and the hardware driver draining the queue run asynchronously. Worse, the duration between fill or drain events varies with the load on the system and external conditions, such as the network interface’s physical medium. For example, on a busy system, the IP stack will get fewer opportunities to add packets to the queue, which increases the chances that the hardware will drain the queue before more packets are queued. For this reason, it is advantageous to have a very large queue to reduce the probability of starvation and ensure high throughput. Although a large queue is necessary for a busy system to maintain high throughput, it has the downside of allowing for the introduction of a large amount of latency. Figure 4 shows a driver queue that is almost full with TCP segments for a single high-bandwidth, bulk traffic flow (blue). Queued last is a packet from a VoIP or gaming flow (yellow). Interactive applications like VoIP or gaming typically emit small packets at fixed intervals that are latency-sensitive, while a high-bandwidth data transfer generates a higher packet rate and larger packets. This higher packet rate can fill the queue between interactive packets, causing the transmission of the interactive packet to be delayed. A network interface that is capable of transmitting at 5 Mbit/sec or 5,000,000 bits/sec. The depth of the queue is 128 descriptors. There are 127 bulk data packets and one interactive packet queued last. Given the above assumptions, the time required to drain the 127 bulk packets and create a transmission opportunity for the interactive packet is (127 * 12,000) / 5,000,000 = 0.304 seconds (304 milliseconds for those who think of latency in terms of ping results). This amount of latency is well beyond what is acceptable for interactive applications, and this does not even represent the complete round-trip time—it is only the time required to transmit the packets queued before the interactive one. As described earlier, the size of the packets in the driver queue can be larger than 1,500 bytes, if TSO, UFO or GSO are enabled. This makes the latency problem correspondingly worse. Large latencies introduced by over-sized, unmanaged queues is known as Bufferbloat (http://en.wikipedia.org/wiki/Bufferbloat). For a more detailed explanation of this phenomenon, see the Resources for this article. As the above discussion illustrates, choosing the correct size for the driver queue is a Goldilocks problem—it can’t be too small, or throughput suffers; it can’t be too big, or latency suffers. Byte Queue Limits (BQL) is a new feature in recent Linux kernels (> 3.3.0) that attempts to solve the problem of driver queue sizing automatically. 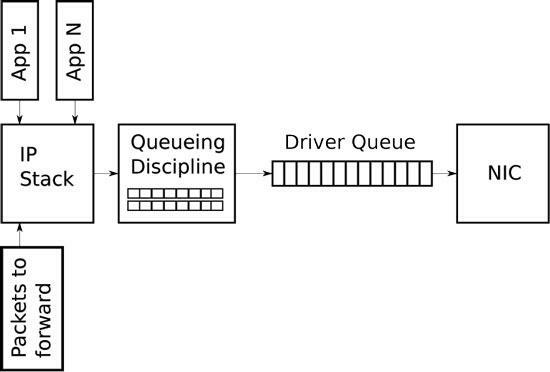 This is accomplished by adding a layer that enables and disables queueing to the driver queue based on calculating the minimum queue size required to avoid starvation under the current system conditions. Recall from earlier that the smaller the amount of queued data, the lower the maximum latency experienced by queued packets. It is key to understand that the actual size of the driver queue is not changed by BQL. Rather, BQL calculates a limit of how much data (in bytes) can be queued at the current time. Any bytes over this limit must be held or dropped by the layers above the driver queue. A real-world example may help provide a sense of how much BQL affects the amount of data that can be queued. On one of the author’s servers, the driver queue size defaults to 256 descriptors. Since the Ethernet MTU is 1,500 bytes, this means up to 256 * 1,500 = 384,000 bytes can be queued to the driver queue (TSO, GSO and so forth are disabled, or this would be much higher). However, the limit value calculated by BQL is 3,012 bytes. As you can see, BQL greatly constrains the amount of data that can be queued. BQL reduces network latency by limiting the amount of data in the driver queue to the minimum required to avoid starvation. 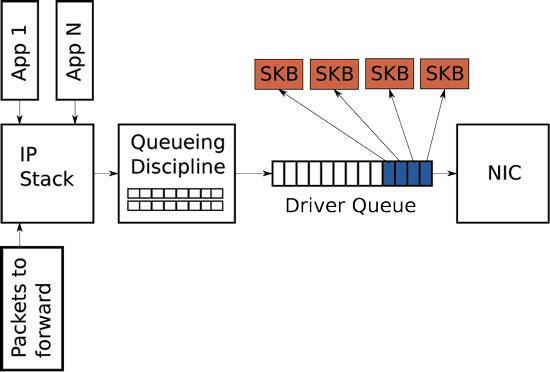 It also has the important side effect of moving the point where most packets are queued from the driver queue, which is a simple FIFO, to the queueing discipline (QDisc) layer, which is capable of implementing much more complicated queueing strategies. The driver queue is a simple first-in, first-out (FIFO) queue. It treats all packets equally and has no capabilities for distinguishing between packets of different flows. This design keeps the NIC driver software simple and fast. Note that more advanced Ethernet and most wireless NICs support multiple independent transmission queues, but similarly, each of these queues is typically a FIFO. A higher layer is responsible for choosing which transmission queue to use. 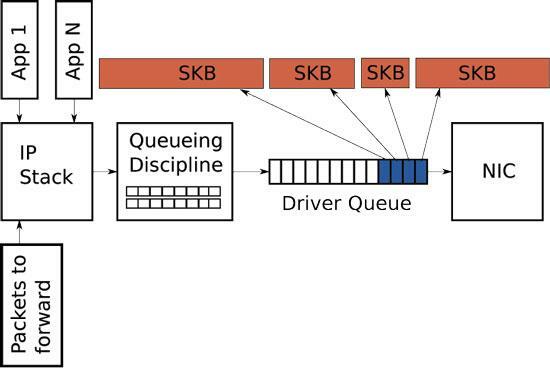 Sandwiched between the IP stack and the driver queue is the queueing discipline (QDisc) layer (Figure 1). This layer implements the traffic management capabilities of the Linux kernel, which include traffic classification, prioritization and rate shaping. The QDisc layer is configured through the somewhat opaque tc command. There are three key concepts to understand in the QDisc layer: QDiscs, classes and filters. The QDisc is the Linux abstraction for traffic queues, which are more complex than the standard FIFO queue. This interface allows the QDisc to carry out complex queue management behaviors without requiring the IP stack or the NIC driver to be modified. By default, every network interface is assigned a pfifo_fast QDisc (http://lartc.org/howto/lartc.qdisc.classless.html), which implements a simple three-band prioritization scheme based on the TOS bits. Despite being the default, the pfifo_fast QDisc is far from the best choice, because it defaults to having very deep queues (see txqueuelen below) and is not flow aware. The second concept, which is closely related to the QDisc, is the class. Individual QDiscs may implement classes in order to handle subsets of the traffic differently—for example, the Hierarchical Token Bucket (HTB, http://lartc.org/manpages/tc-htb.html). QDisc allows the user to configure multiple classes, each with a different bitrate, and direct traffic to each as desired. Not all QDiscs have support for multiple classes. Those that do are referred to as classful QDiscs, and those that do not are referred to as classless QDiscs. Filters (also called classifiers) are the mechanism used to direct traffic to a particular QDisc or class. There are many different filters of varying complexity. The u32 filter (http://www.lartc.org/lartc.html#LARTC.ADV-FILTER.U32) is the most generic, and the flow filter is the easiest to use. In looking at the figures for this article, you may have noticed that there are no packet queues above the QDisc layer. The network stack places packets directly into the QDisc or else pushes back on the upper layers (for example, socket buffer) if the queue is full. The obvious question that follows is what happens when the stack has a lot of data to send? This can occur as the result of a TCP connection with a large congestion window or, even worse, an application sending UDP packets as fast as it can. The answer is that for a QDisc with a single queue, the same problem outlined in Figure 4 for the driver queue occurs. That is, the high-bandwidth or high-packet rate flow can consume all of the space in the queue causing packet loss and adding significant latency to other flows. Because Linux defaults to the pfifo_fast QDisc, which effectively has a single queue (most traffic is marked with TOS=0), this phenomenon is not uncommon. As of Linux 3.6.0, the Linux kernel has a feature called TCP Small Queues that aims to solve this problem for TCP. TCP Small Queues adds a per-TCP-flow limit on the number of bytes that can be queued in the QDisc and driver queue at any one time. This has the interesting side effect of causing the kernel to push back on the application earlier, which allows the application to prioritize writes to the socket more effectively. At the time of this writing, it is still possible for single flows from other transport protocols to flood the QDisc layer. Another partial solution to the transport layer flood problem, which is transport-layer-agnostic, is to use a QDisc that has many queues, ideally one per network flow. Both the Stochastic Fairness Queueing (SFQ, http://crpppc19.epfl.ch/cgi-bin/man/man2html?8+tc-sfq) and Fair Queueing with Controlled Delay (fq_codel,http://linuxmanpages.net/manpages/fedora18/man8/tc-fq_codel.8.html) QDiscs fit this problem nicely, as they effectively have a queue-per-network flow. The ethtool command (http://linuxmanpages.net/manpages/fedora12/man8/ethtool.8.html) is used to control the driver queue size for Ethernet devices. ethtool also provides low-level interface statistics as well as the ability to enable and disable IP stack and driver features. You can see from the above output that the driver for this NIC defaults to 256 descriptors in the transmission queue. Early in the Bufferbloat investigation, it often was recommended to reduce the size of the driver queue in order to reduce latency. With the introduction of BQL (assuming your NIC driver supports it), there no longer is any reason to modify the driver queue size (see below for how to configure BQL). ethtool also allows you to view and manage optimization features, such as TSO, GSO, UFO and GRO, via the -k and -K flags. The -kflag displays the current offload settings and -K modifies them. As discussed above, some optimization features greatly increase the number of bytes that can be queued in the driver queue. You should disable these optimizations if you want to optimize for latency over throughput. It’s doubtful you will notice any CPU impact or throughput decrease when disabling these features unless the system is handling very high data rates. The BQL algorithm is self-tuning, so you probably don’t need to modify its configuration. BQL state and configuration can be found in a /sys directory based on the location and name of the NIC. For example: /sys/devices/pci0000:00/0000:00:14.0/net/eth0/queues/tx-0/byte_queue_limits. The length of the transmission queue in Linux defaults to 1,000 packets, which is a large amount of buffering, especially at low bandwidths. The interesting question is what queue does this value control? One might guess that it controls the driver queue size, but in reality, it serves as a default queue length for some of the QDiscs. Most important, it is the default queue length for the pfifo_fast QDisc, which is the default. The “limit” argument on the tc command line can be used to ignore the txqueuelen default. 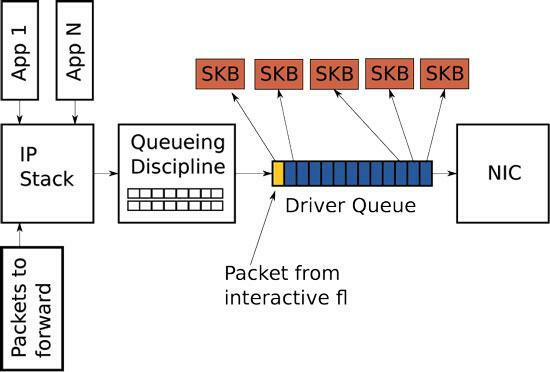 As introduced earlier, the Linux kernel has a large number of queueing disciplines (QDiscs), each of which implements its own packet queues and behaviour. Describing the details of how to configure each of the QDiscs is beyond the scope of this article. For full details, see the tc man page (man tc). You can find details for each QDisc in man tc qdisc-name (for example, man tc htb orman tc fq_codel). The per-socket TCP queue limit can be viewed and controlled with the following /proc file: /proc/sys/net/ipv4/tcp_limit_output_bytes. You should not need to modify this value in any normal situation. Unfortunately, not all of the over-sized queues that will affect your Internet performance are under your control. Most commonly, the problem will lie in the device that attaches to your service provider (such as DSL or cable modem) or in the service provider’s equipment itself. In the latter case, there isn’t much you can do, because it is difficult to control the traffic that is sent toward you. However, in the upstream direction, you can shape the traffic to slightly below the link rate. This will stop the queue in the device from having more than a few packets. Many residential home routers have a rate limit setting that can be used to shape below the link rate. Of course, if you use Linux on your home gateway, you can take advantage of the QDisc features to optimize further. There are many examples of tc scripts on-line to help get you started. Queueing in packet buffers is a necessary component of any packet network, both within a device and across network elements. Properly managing the size of these buffers is critical to achieving good network latency, especially under load. Although static queue sizing can play a role in decreasing latency, the real solution is intelligent management of the amount of queued data. This is best accomplished through dynamic schemes, such as BQL and active queue management (AQM,http://en.wikipedia.org/wiki/Active_queue_management) techniques like Codel. This article outlines where packets are queued in the Linux network stack, how features related to queueing are configured and provides some guidance on how to achieve low latency.